For any real estate professional who is serious about building their brand and online reputation, social media analytics tools are a need not a want. Still deciding which ones to use? We've got your covered. Google Analytics is not limited to measuring sales and conversion - it provides you with compelling insights into how users use your site, how they arrived on your site, and how to keep them coming back. Improve performance across your sites, apps, and other marketing channels. Google Analytics and related products can help you turn customer insights into actionable solutions for your business. This feature provides a single, accurate view of the customer that can be customized to your needs and shared across the organization. Google delivers integrated solutions that preserve data integrity, reduce friction, and seamlessly connect disparate data sources. Reports can be segmented and filtered to reflect the needs of your business while real-time views let you know which new content is popular, how much traffic today's new promotion is driving to your site, and which tweets and blog posts draw the best results. Make smarter marketing decisions. Google Analytics allows you to seamlessly activate your data to improve marketing campaigns and experiment with new channels and content. To learn more about Google Analytics or to download the app, visit: www.google.com/analytics. Created to give Twitter users a more efficient way of managing their accounts. Built with the initial aim to answer the all too often question, "Who unfollowed me on Twiter?" 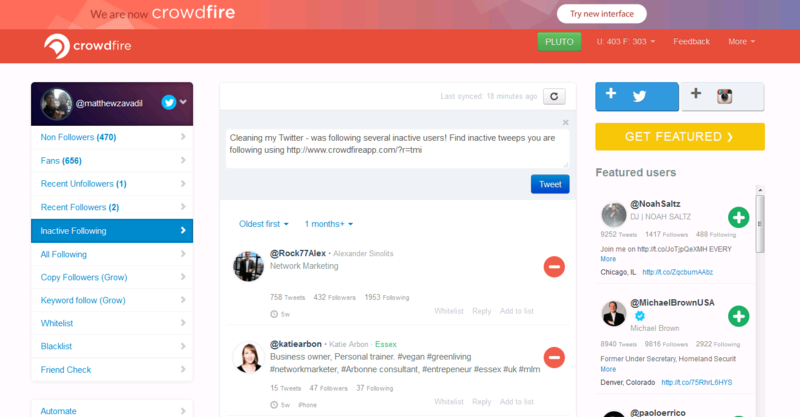 Crowdfire allows you to manage your Twitter and Instagram far more effectively than ever before. Crowdfire is an extremely powerful product to get more targeted engagement and followers on Twitter and Instagram.Crowdfire provides power connections that will help users achieve the social media goals they have - be it brand recognition, individual popularity, more sales, clients or fans. Send a welcome DM to every new follower - automatically. Search tweeps by location or keyword. See people who you don't follow back and people who don't follow you back. Very powerful feature to find the perfect people who will follow you back. To learn more about Crowdfire or to download the app, visit: www.crowdfire.com. SocialBro is the #1 Twitter marketing platofrm with analytics and management functionality to help you analyze, engage, and monetize your Twitter marketing efforts. Analyze, engage, and monetize your Twitter audience with tools that can help you create targeted audience lists; design and manage Twitter campaigns; access powerful in-depth insights about your Twitter community; analyze your competitors, and so much more. Access powerful in-depth analytics about your Twitter community. Find the best time to Tweet for maximum engagement. Segment and filter users with customized queries. Log-in to your SocialBro account from any computer, in any browser, and all your data is stored securely in the cloud. To learn more about SocialBro or to download the app, visit: www.socialbro.com. Any link, text, picture or video you want to share, just add it to your Buffer. Your updates will automatically be scheduled and spaced out throughout the day to post to your favorite social networks. Plus, any update can also be “posted now” inside the app. Buffer is the easiest way to share on Twitter, Facebook, Google+, LinkedIn and App.net. Schedule your updates to post at optimal times, whether you're around or not. Build up a queue of awesome content to share with your friends and followers, and follow up on your posts with Buffer's straightforward analytics to see which posts performed best. Share to multiple Twitter, Facebook, Google+, LinkedIn and Pinterest boards from one place. Spread retweets out so you don't overwhelm your followers all at once. Get analytics for each social update you share: Clicks, retweets, repins, likes, shares, mentions and more. Schedule your posts automatically so you never have to worry about setting a time and date. To learn more about Buffer or to download the app, visit: www.buffer.com. Followerwonk helps you discover and grow your social graph. This app allows you to get into your Twiter analytics to learn who your followers are, where they're located, and when they tweet. Followerwonk creates actionable visualizations that enable you to compare your social graph to others, as well as find and connect with influencers. In addition to advanced Twitter analytics and multiple account support, Followerwonk lets you see how your social media performance and popular content drive traffic to your site. Compare Twitter accounts to find overlaps and target new influencers. Break down your followers by location, bio, who they follow, and more. Match your activities to gains and losses in followers to give your followers what they like best. Compare and contrast your relationships with your competitors and friends. To learn more about Followerwonk or to download the app, visit: www.followerwonk.com. Looking for more real estate apps?